Billy Joe Saunders has vowed to “school” both Gennady Golovkin and Saul ‘Canelo’ Alvarez following his master-class WBO world middleweight title victory over David Lemieux in Montreal on Saturday night. MTK Global-managed Saunders oozed class as he cruised to a dominant unanimous-decision points win over former IBF world champion Lemieux. The Hatfield native, who is now based in Sheffield under trainer Dominic Ingle, was awarded every round on one judge’s card, 120-108, while the other officials scored the bout a lop-sided 118-110, 117-111 to make it a shutout. Saunders (now 26-0, 12KO), having come through his third world-title defence and extending his undefeated record, reiterated his desire to meet Golovkin or ‘Canelo’ if the latter pair cannot agree on terms for a rematch in 2018. “I’ve come into this guy’s backyard and schooled him,” said Saunders. “I’ve done it to Lemieux and now I’ll do it to Canelo and I’ll do it to Golovkin. I’ll fight them anytime, anyplace, anywhere and they both know it. “I’ll give them a boxing lesson. The bookies and some others claimed this was a 50-50 fight against Lemieux and it was nothing but a money-maker for punters who know a good bet when they see one. From the opening bell, Saunders was in confident form against Lemieux, jabbing, moving and displaying his best slick boxing skills as he peppered his opponent with combinations. The 28-year-old southpaw bamboozled the heavy-handed Canadian, who landed little throughout the bout, with the champion openly mocking his opponent’s failure to catch him. Saunders landed a big right hand early on in the seventh, staggering his foe, before bloodying the home fighter’s nose with a left hand moments later. While Lemieux attempted to finish strongly, catching Saunders late on in the penultimate round, the champion was unruffled and eased to victory. 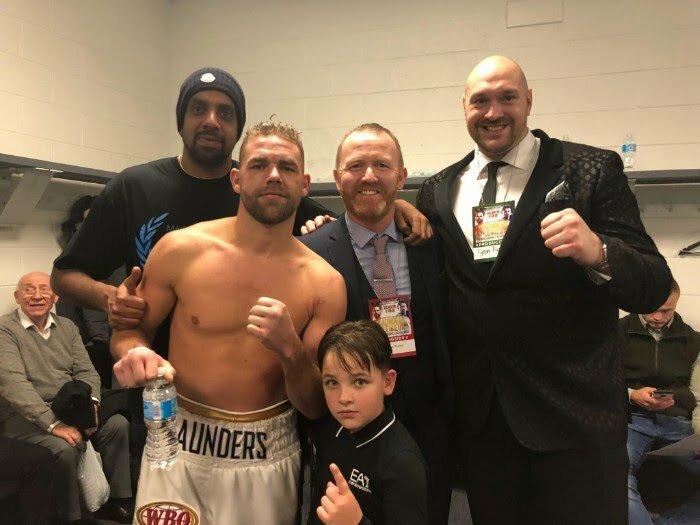 “It was easy because Dominic [Ingle, trainer] told me what to do and everything that he said would happen happened,” said Saunders. “We’ve been working hard for months together and I’m a new fighter and nearly the finished article. “I’ll get my belt home, enjoy Christmas with my family and get back into the gym in the new year and I’ll polish things up to be the best I can be. I’ll make sure I’m ready for whatever comes next. There’ll be no slacking off,” added the MTK Global-backed middleweight. Promoter Frank Warren hopes to book a date against Golovkin or Canelo at some stage in the new year, but he suggested that Saunders may have a competitive keep-busy bout in the spring if neither man is prepared to take on the WBO champion before their anticipated rematch.